The Hemet Unified School District Wellness Policy (BP5030) recognizes the link between student health and learning. Please review the highlights and key components of our wellness policy (in English), (en Espanol). 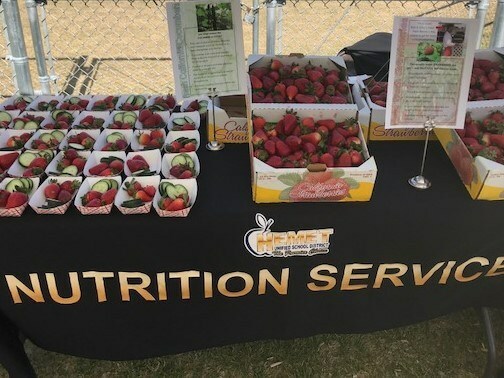 Mission Statement: The Hemet Unified School District Wellness Committee is dedicated to educating, encouraging, and promoting healthier lifestyles in our community. We will achieve this by facilitating successful cognitive, social, emotional and physical development of students, staff and families districtwide. In developing the policy and mission statement, parents/guardians, teachers, students, food service professionals, school administrators, Board representatives and members of the public participated in the process. Hemet Unified School District is interested in engaging our stakeholder groups in the development, implementation and evaluation of our Local School Wellness Policy. If you are interested in participating, please contact the Parent Resource Center at (951) 765-0004 for meeting dates and you may visit the center located at 26866 San Jacinto Street, Hemet, 92543. The Hemet Unified School District Wellness Policy has been evaluated using the WellSAT 2.0 Assessment Tool. Click here to see how our district's policy scored. This bill prohibits a school, school district, or charter school from advertising food or beverages during the school day that do not comply with nutrition standards of Smart Snacks In Schools. Please review the Quick Reference Card to determine if the food or beverage fundraiser and promotional materials are compliant with this new law. Nutrition standards adopted by the district for all foods and beverages sold to students, including foods and beverages provided throughout the district's food service program, student stores, vending machines, fundraisers, or other venues, shall meet or exceed state and federal nutrition standards. Organizations are encouraged to use non-food items or healthy foods where appropriate, for fundraising. Staff are encouraged to avoid the use of non-nutritious foods as a reward for students' academic performance, accomplishments, or classroom behavior. Parents/guardians or other volunteers are encouraged to support the district's nutrition education program by considering nutritional quality when electing any snacks which they may donate for occasional class parties, and by eliminating foods or beverages that do not meet nutritional standards and are not commercially prepared. Class parties or celebrations shall be held after the lunch period, and no more frequently than once per month. http://www.ascr.usda.gov/complaint_filing_cust.html and at any USDA office, or write a letter addressed to USDA and provide in the letter all of the information requested in the form. Para presentar una denuncia de discriminación, complete el Formulario de Denuncia de Discriminación del Programa del USDA, (AD-3027) que está disponible en línea en: http://www.ocio.usda.gov/sites/default/files/docs/2012/Spanish_Form_508_Compliant_6_8_12_0.pdf. y en cualquier oficina del USDA, o bien escriba una carta dirigida al USDA e incluya en la carta toda la información solicitada en el formulario. Para solicitar una copia del formulario de denuncia, llame al (866) 632-9992.